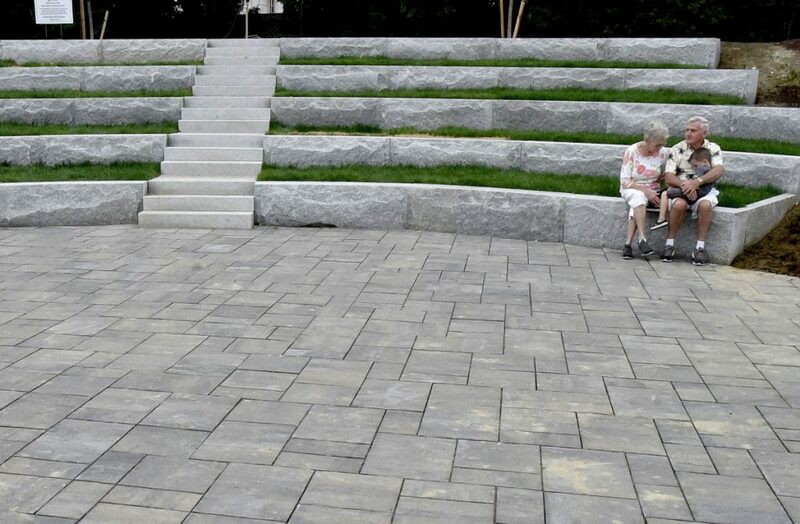 Work is mostly complete on the $1.5 million park along the Kennebec and a dedication is set for Oct. 6. WATERVILLE — The RiverWalk at Head of Falls was a hive of activity Monday morning with people walking dogs, a Colby College professor and his class checking out the Kennebec River, and public works employees installing a conduit for electricity to an outdoor amphitheater. Skateboarders Storm Powell, left, and Michael Stewart enjoy their sport on the paths and obstacles at the RiverWalk at Head of Falls in Waterville on Monday. “This place is great for skateboarding,” Stewart said. He was talking about the $1.5 million RiverWalk that features a lighted, 900-foot boardwalk along the river, a gazebo, a large interactive children’s play area, art installations and landscaping, including trees and flowers. Though the RiverWalk is open to the public, workers are still adding features. A dedication ceremony will be held at 2 p.m. on Oct. 6. Former Sen. George J. Mitchell, who lived at Head of Falls when he was a small child, will be the principal speaker at the ceremony. Designed by Mitchell & Associates of Portland, the RiverWalk was funded with donations. The Waterville Rotary Club in 2015 gave the lead gift of $150,000 for the RiverWalk project as a way of celebrating its centennial. City councilors accepted $50,000 from the Waterville Development Corp., and that funding was part of $300,000 the city raised locally to match a $300,000 grant from the Land and Water Conservation Fund. Kennebec Savings Bank donated $150,000, and Mitchell and his family members donated $100,000. Other donations include $75,000 from Colby College, $15,000 from Kennebec Messalonskee Trails and $10,000 from Inland Hospital. Roy said Monday that they are $18,000 short of their goal of $1.5 million. Many paving stones at the RiverWalk and inside the gazebo bear names of people and organizations who donated to the effort or names of loved ones who have passed. On Monday, friends Brenda Whitney, John Griffin and Kathy Harding sat by the gazebo with their dogs, which they walk at Head of Falls every day. Whitney, 70, of Waterville, Griffin, 62, of Sidney and Harding, 62, of Waterville met while walking their pets near the riverbank and now are good friends. Griffin, with his Wheaton Terrier, Benji, ikes the RiverWalk design and the change from what it was before – a lawn on the river. Harding, with her miniature Australian shepherd, loves the RiverWalk. The sculpture “The River Stone,” by Jesse Salisbury of Fieldstone LLC of Steuben, was moved Monday from Castonguay Square to the RiverWalk. Roy said the RiverWalk exceeds his vision of what he thought it would be. The theme of the RiverWalk, he said, is “Waterville’s Return to the River,” and many people came up with a lot of ideas for what the RiverWalk should include. Features will include interpretive signs along the boardwalk for people to read about the river, native Americans and the log drive that ended in the late 1970s.